Local historian and broadcaster Coy Barefoot talks to Charlottesville author, historian and cartographer Rick Britton. Inside Charlottesville is heard on WPVC 94.7 Monday afternoons from 4:00 – 6:00 p.m. The station is looking for volunteers. Travis McDonald speaking at the Senior Center in Charlottesville. On March 31, 2016, Travis McDonald presented the fourth and final part of our Thursday series entitled Jefferson’s Legacies. Travis McDonald is an architectural historian who has directed the restoration of Thomas Jefferson’s villa retreat Poplar Forest since 1989. The restoration has been acknowledged as one of the most authentic such projects in the United States. 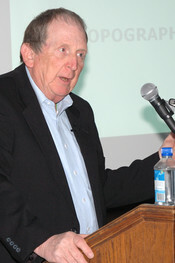 Mr. McDonald has written and lectured extensively on Jefferson, Poplar Forest and early Virginia architecture. He formally worked for the chief historical architect of the National Park Service for the Colonial Williamsburg foundation and has directed museum restorations in Virginia for more than thirty years. Travis received his graduate degree in architectural history from the University of Virginia School of Architecture. In 2011, he was awarded the highest award, The Architecture Medal for Virginia Service by the Virginia Chapter of the American Institute of Architects for his work on Poplar Forest. Mr. McDonald serves on many historic preservation advisory boards including that for Thomas Jefferson’s buildings at the University of Virginia. The lecture series was organized by award-winning historian and Charlottesville-based author, lecturer, and cartographer Rick Britton in conjunction with the Senior Center in Charlottesville. Click here to listen to all four parts of this series. Rick Britton speaking at the Senior Center in Charlottesville. On March 10, 2016, Rick Britton presented the third lecture in our four part CPN Thursday series entitled Jefferson’s Legacies. The story of the founding of the Thomas Jefferson Foundation is full of many odd twists and turns. Following his death, the Jefferson estate fell into the hands of private owners. In this podcast, you will learn how the United States third president’s home, Monticello, came to be a public place in honor of its most famous resident. 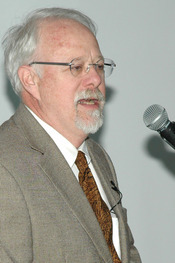 Rick Britton is a historian of the Old Dominion who specializes in 18th- and 19th-century Virginia history. Two of his main areas of expertise are the American Civil War and the life and times of our third president, Thomas Jefferson. Along with his writing, Rick conducts tours of Civil War battlefields, teaches classes on the history of central Virginia, organizes history programming for the Senior Center in Charlottesville, illustrates maps for history books, and lectures all across Virginia on a wide range of topics. 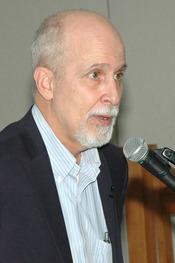 With over 200 published articles and essays under his belt, he’s the author of Albemarle & Charlottesville: An Illustrated History and Jefferson: A Monticello Sampler for which he was awarded a medal for non-fiction at New York City’s Book Expo, the nation’s largest book convention. His newest book, Virginia Vignettes (Vol. 1) – Famous Characters & Events in Central Virginia History, is the first of a new series featuring some of the men and women who figure large in 18th- and 19th-century American history. The lecture was presented by Rick Britton as a part of this series and was held in conjunction with the Senior Center in Charlottesville. Click here to listen to all four parts of this series. Beth Sawyer speaking at the Senior Center in Charlottesville. On March 3, 2016, Beth Sawyer presented the second lecture in a our four part CPN Thursday series entitled Jefferson’s Legacies. In this podcast you will learn about more than just the famous Jefferson home at Monticello. Jefferson’s time “on the mountain” left a rich archaeological legacy which is still being investigated today. Beth Sawyer is an archaeological analyst at Monticello and works in the archaeology lab processing artifacts and performing analysis as well as working with public programs. 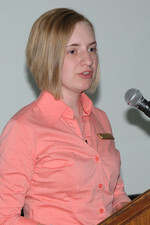 A graduate of William and Mary University, she volunteered with the Fairfield Foundation in Tidewater, and interned with Montpelier before joining the Monticello team. For the past ten years she has been engaged with every aspect of the archaeology department including field work, artifact processing, museum exhibits, public archaeology programs and the current mountain top restoration project. Her varied research interests include plantation archaeology and ceramic analysis, but she most enjoys sharing her findings and engaging with the public. Peggy Cornett speaking at the Senior Center in Charlottesville. On February 18, 2016, Peggy Cornett presented the first lecture in a new four part CPN Thursday series entitled Jefferson’s Legacies. Third president of the United States Thomas Jefferson had many interests including a love of botany. Monticello Curator of Plants Peggy Cornett talks about Jefferson’s interest in botany the effects of which can still be seen today. Peggy Cornett has worked at Monticello since 1983. Shebegan as an associate director of gardens and grounds and from 1992 to 2009 she served as director of the Thomas Jefferson Center for Historic Plants. Before Ms. Cornett assumed her current position, Curator of Plants, she graduated from the University of North Carolina at Chapel Hill with degrees in English and botany and a master’s degree in public garden administration from the Longwood Graduate program at the University of Delaware. Ms. Cornett has lectured widely on garden history topics throughout the United States as well as at the American Museum in Bath England, and for the Bermuda Rose society in Hamilton Bermuda. 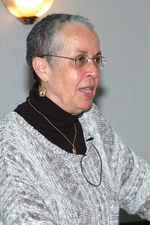 Peggy writes articles for gardening magazines, professional journals, including the American Public Garden Association, and she wrote, produced and edited Twinleaf, the Thomas Jefferson Center for Historic Plants annual journal and catalog. Since 1990 she has edited and produced Magnolia, the quarterly publication of the Southern Garden History Society. Leni Sorensen speaking at the Senior Center in Charlottesville. 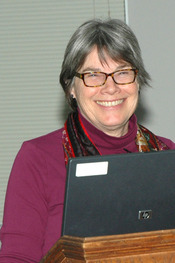 On April 30, 2015, Leni Sorensen presented the sixth and final part of our CPN Thursday series entitled The Civil War Through Different Lenses (2015). “In 1820 only 12% of the enslaved had been born in Africa. By the decade leading to the Civil War, American Slaves were Christian, with English their first and only language,” says Sorensen in this interesting talk about the role slaves played in the development of the plantation system. Leni Sorensen majored in history at Mary Baldwin, and earned her MA and PhD in American Studies at the College of William and Mary. For over thirty years she worked as a university lecturer, museum consultant, hands on presenter and researcher with a focus on African American slavery, American agriculture and Woman’s work in colonial and post-colonial America. Formerly Monticello’s African-American Research Historian, Ms. Sorensen teaches rural life skills such as canning, butchering, and cookery from her home in Western Albemarle County. Click here to listen to all six parts of this series. Beth Parnicza speaking at the Senior Center in Charlottesville. On April 23, 2015, Beth Parnicza presented the fifth of our six part CPN Thursday series entitled The Civil War Through Different Lenses (2015). In this podcast, Ms. Parnicza shares her personal memories of four years of the American Civil War sesquicentennial visiting and tour leading, a review of the Fredericksburg & Spotsylvania National Military Park’s four commemorations as well as a look at the broader picture of trying to understand what the sesquicentennial was about and what it means to us now and in the future. Beth Parnicza is an historian with the National Parks Service at the Fredericksburg & Spotsylvania National Military Park where she supervises the Chancellorsville Battlefield Center and manages volunteers and social media. 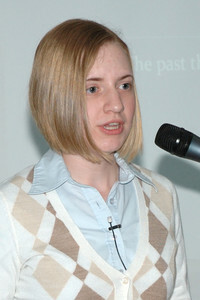 A 2011 graduate of West Virginia University, her research interests focuses largely on the human element of the Civil War, particularly in understanding the steps taken by individuals toward a harder kind of war and their motivations to do so. Ron Wilson speaking at the Senior Center in Charlottesville. 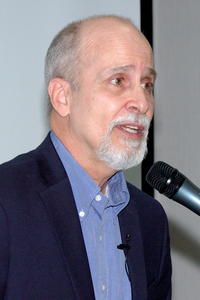 On April 16, 2015, Ron Wilson presented the fourth lecture in our six part CPN Thursday series entitled The Civil War Through Different Lenses (2015). Listen as Wilson describes with exquisite detail the final 90 minutes of the American Civil War as it happened on April 9, 1865, and the two great men that ended it. A native of Ohio, Wilson retired from the National Parks Service in 2000 after 34 years of service. He served as Supervisory Park Ranger at Appomattox Court House for 25 years. Previous park service assignments include Gettysburg, Allegheny Portage Railroad National Historic Site, Johnstown Flood National Memorial and the Lincoln Boyhood National Memorial. Mr. Wilson co-authored the Appomattox Paroles April 9-15, 1865 and is a former president of the Lynchburg Virginia Civil War Round Table. 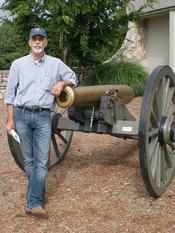 He also worked with Civil War battlefield historian Chris Calkins to establish the Lee’s Retreat Driving Tour. Mr. Wilson graduated from Miami University. During the Vietnam War he commanded a rifle platoon and served as headquarters commandant for the 1st Marine Regiment. On April 9, 2015, Rick Britton presented the third lecture in our six part CPN Thursday series entitled The Civil War Through Different Lenses (2015). In this podcast you will learn about the role that Monticello played in the American Civil War. At the commencement of the war, Monticello was the property of Uriah Phillips Levy, who had purchased it in 1834. Listen as Rick tells the story of how Monticello’s ownership changed hands several times as the war progressed. The lecture was presented by Rick Britton as a part of this series and was held in conjunction with the Senior Center in Charlottesville. Click here to listen to all six parts of this series. Ron Coddington speaking at the Senior Center in Charlottesville. On April 2, 2015, Ron Coddington presented the second lecture in our six part CPN Thursday series entitled The Civil War Through Different Lenses (2015). Listen as Mr. Coddington tells the story of how both the North and South developed their navy during the American Civil War. While other kids in his neighborhood were collecting baseball cards, 14-year-old Ron Coddington was browsing flee markets looking for old photographs. Little did he realize that after purchasing his first photograph in 1977 that collecting photographic images would become a life long pursuit. Mr. Coddington is the assistant manager at Chronicle of Higher Education whose work has appeared in USA Today, the Atlanta Journal Constitution and the San Hose Mercury News. Mr. Coddington is a contributing writer to the New York Times disunion series, and writes a monthly column for The Civil War News. In addition to African American Faces of the Civil War: An Album, Mr. Coddington has written two other books, Faces of the Confederacy: An Album of Southern Soldiers and Their Stories, and Faces of the Civil War: An Album of Union Soldiers and Their Stories. Click here to listen to all five parts of this series. Dale Floyd speaking at the Senior Center in Charlottesville. On March 19, 2015, Dale Floyd presented the first lecture in a new six part CPN Thursday series entitled The Civil War Through Different Lenses (2015). “The army regulations stipulated that the topographical engineers were to make such surveys and exhibit such delineations as the commanding general shall direct, to make plans of all military positions which the army may occupy and of their respective vicinities indicating the various roads, rivers, creeks, ravines, hills, woods and villages to be found therein,” says Floyd in this interesting podcast. Born in Dayton Ohio, Mr. Floyd received his BS in education from Ohio University and an MA in history from the University at Dayton. 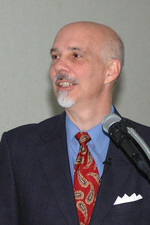 He also completed additional history post graduate work at American University and at the University of Virginia. 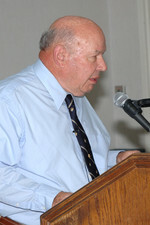 He has written nine books on military history. Mr. Floyd has been an archivist at the National Archives, and an historian with the US Army Core of Engineers and the National Park Service. As a military historian Mr. Floyd specializes in military architecture, military education and 19th century military history. On April 17, 2014, Beth Parnicza presented the fifth and final lecture in our Thursday series entitled The Civil War Through Different Lenses (2014). How does a culture view its past and how does it present itself through a museum forum? How do we understand a society through its museum exhibits? This and many other questions on how we perceive the American Civil War are answered in this interesting podcast. Beth Parnicza is an historian with the National Parks Service at the Fredericksburg & Spotsylvania National Military Park where she supervises the Chancellorsville Battlefield Center and manages volunteers and social media. 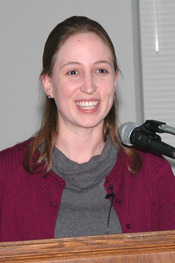 A 2011 graduate of West Virginia University, her research interests focus largely on the human element of the Civil War, particularly in understanding the steps taken by individuals toward a harder kind of war and their motivations to do so.